We’ve recently had our Learning Outside the Classroom Quality Badge renewed as a reflection of good quality educational provision. The renewal of the nationally recognised badge shows our continued commitment to sustain high quality learning outside the classroom and that we meet all of the Quality Badge indicators set by the Council for Learning Outside the Classroom. A big thumbs up for everyone on the Lea Green team! 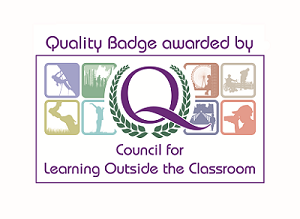 The award of the LOtC Quality Badge indicates that the provider understands schools’ needs and can tailor their offer to fit in with both current curriculum requirements and any specific requirements of the school. The LOtC Quality Badge helps you to ensure you are making the best possible use of school time and that your young people will access good quality educational experiences – ideal when justifying LOtC to your senior management team or governors. All types of provider organisation are subject to the same quality indicators and have to meet the same standards to achieve the award. By looking for the LOtC Quality Badge when selecting where to take young people, you can be assured of quality and safety across all sectors, from museums and art galleries to farms, adventurous activities and expeditions overseas. The Outdoor Education Advisers’ Panel endorse the LOtC Quality Badge and the majority of Local Authority Outdoor Education Advisers have indicated that they accept the award in place of some or all of their checks. You can view which Local Authority Outdoor Education Advisers support the LOtC Quality Badge by visiting the OEAP website. The LOtC Quality Badge reduces the red tape associated with learning outside the classroom, thereby making it easier for teachers to ensure that all children will get the opportunity to have wider educational experiences. There are currently around 1,000 providers who have been awarded the LOtC Quality Badge, so wherever you are in the UK, or wherever you want to take your young people, there is an accredited provider. You can search for LOtC Quality Badge holders by area or by type, quickly and easily on the LOtC Quality Badge website.